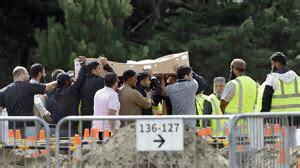 Five days after the worst mass shooting in New Zealand’s modern history, the coroner’s office has begun releasing bodies, allowing the families of some of the victims to lay their loved ones to rest. At least five victims were laid to rest on Wednesday at the Memorial Park Cemetery, following the release of the bodies a day earlier. Among those buried were a 15-year-old Syrian refugee Hamza Mustafa and his father, Khalid, 44. They had just arrived in New Zealand six months before they were killed. Hamza’s younger brother Zaid, 13, suffered gunshot wounds to the leg in the attack. He was seen being pushed around in a wheelchair during the ceremony. Junaid Ismail, 36, and Ashraf Ali, 58, were buried in seperate ceremonies later on Wednesday. The fifth buried victim’s name could not be reported. Be the first to comment on "Families of Christchurch attack victims bury their loved ones"